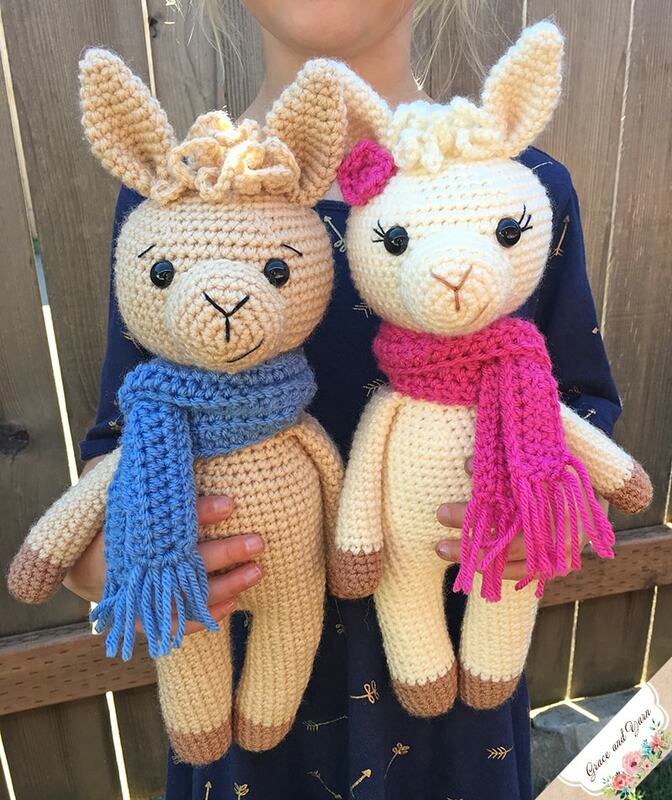 Awhile back we had a super fun CAL (crochet-a-long) to make these sweet Llamas. In an attempt to organize a little bit here on the blog I have combined all 3 parts of the CAL into one post. 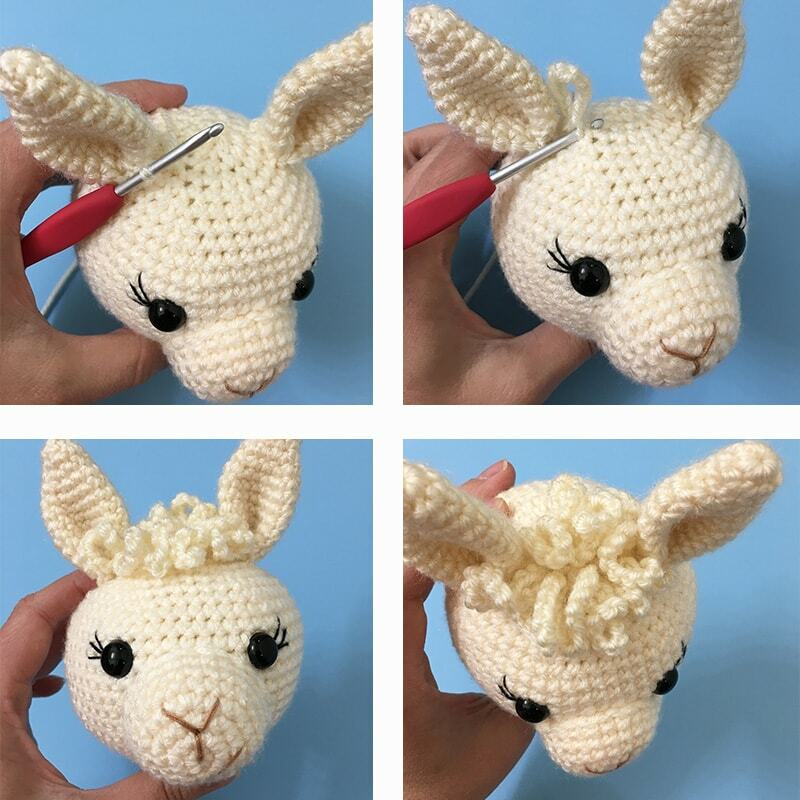 So, now you can make your llama without having to jump to each post, the full pattern is available below! These llamas work up quite quickly with few color changes. The legs and body are made as one piece and the neck is at a great width to help reduce the chance of a wobbly head. For this pattern you will want to be familiar with making a magic circle, invisible decreases and color changes. 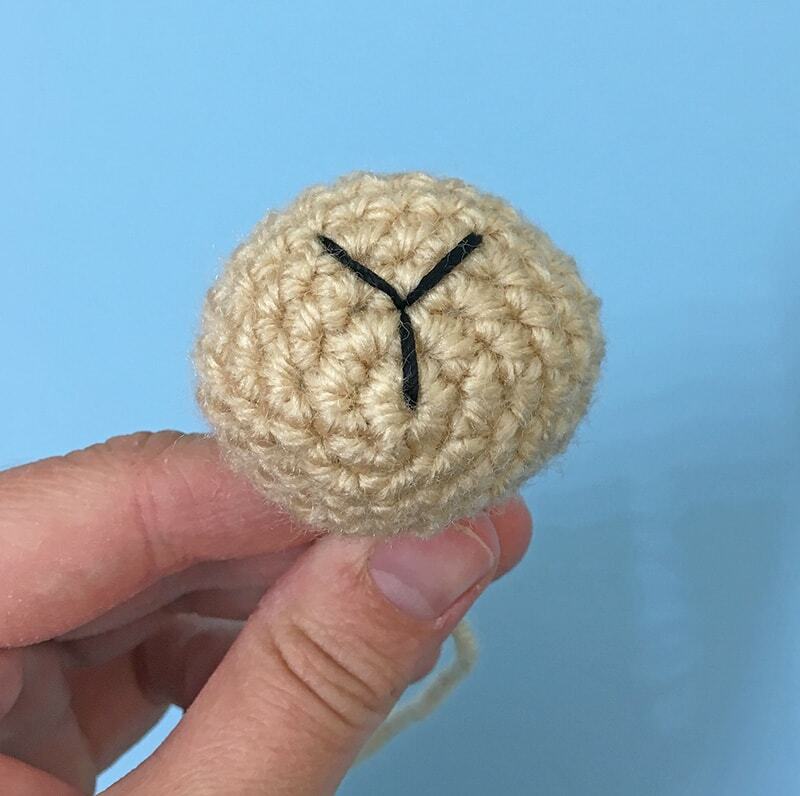 If these are new methods to you, a mini tutorial for each can be found on the Tips to Learning Amigurumi page, complete with helpful photos along the way! Be sure to also check out the Grace and Yarn Crochet Group on Facebook to see many of the other Llamas made during our CAL. I love all of the different colors and yarns used! Here's a variegated version I made with Hobby Lobby's I Love This Yarn in Sherbet Stripes! The color choices for this pattern are endless! If you'd like to be notified when new patterns are released you can sign-up for my newsletter here! I'll keep you updated on new patterns, giveaways and tutorials as they're posted! Grab an ad-free printable version in my Etsy or Ravelry shop! PIN to your favorite crochet board here! You may make and sell items from this pattern but please do not sell, share or reproduce the actual pattern. 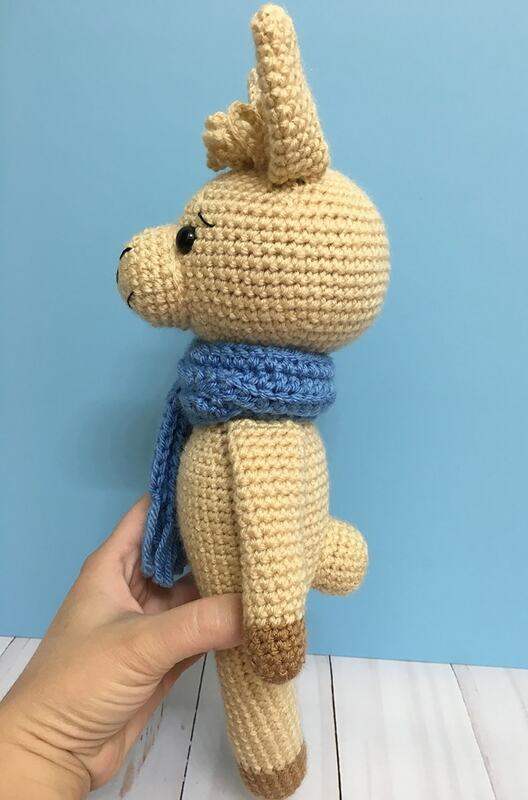 If you sell finished items online (Etsy, etc) please provide a link to the pattern and credit to me as the designer, thank you. I hope you enjoy this pattern! If you would prefer an alternative to plastic safety eyes these are my favorites! We will be working in continuous rounds, I recommend using a stitch marker either at the beginning or end of each round to help keep track. Slowly stuff as you go, you will want each part to be firm but not stretched. Note: You will be using your 3.5mm hook for the majority of the pattern. The 5mm hook will be used solely for the scarf. Fasten off on the first leg only. When you are finished with the 2nd leg proceed to round 23 to join the legs and start the body. 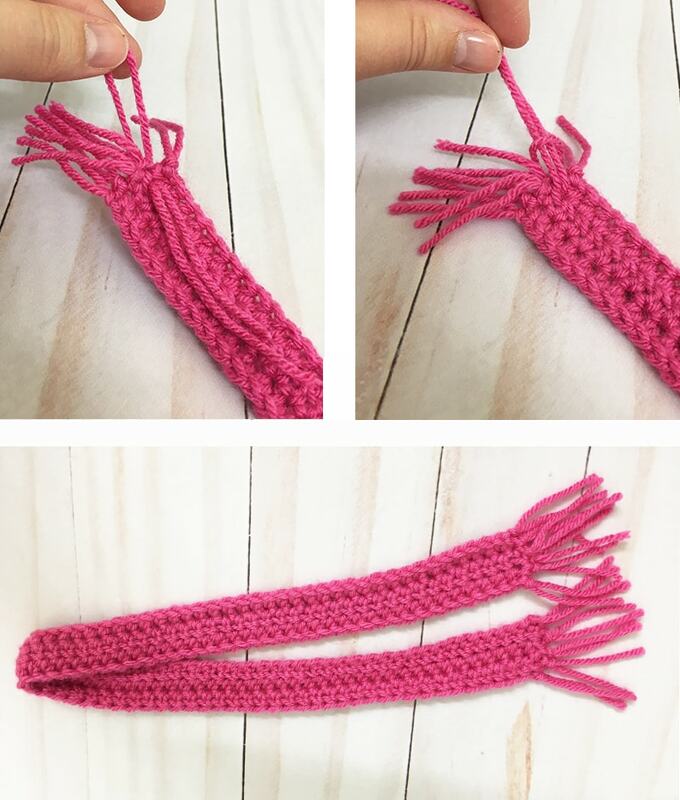 You will end up crocheting across each side of the chain, this acts as a bridge to join the legs together. This completes your join and is where your next round will start. With black crochet or embroidery thread make a 'V' for the nose with a line added a few stitches down. Feel free to add a smile for extra detail. You can also use black yarn either as is or you can pull it apart to make a thinner nose. Here is where we will add the eyes and facial features before we start closing the head. Insert the eyes between rounds 15 and 16, 7 stitches apart. If you would like to add eyelashes or eyebrows I recommend doing so before securing the backs onto the eyes. Next, sew your mouth piece centered between the eyes as pictured, stuffing lightly as you go. Fasten off and sew remaining part closed, weave in your end. 1. Sew the ears onto the body at the 5th round on each side. 2. With body color we will make the 'wooly' patch between the ears. Create a slip knot and slip stitch into the stitch closest to the ear as pictured below. Chain 16 and slip stitch into the next stitch towards the other ear. Continue this process until you reach the other ear (this completes one row of 'wool'). Slip stitch into the next stitch towards the back of the head and complete another row back across to the first ear. Feel free to add additional rows to your liking. 3. If you've made a flower, sew onto the ear of your choice. At the end of round 22 pinch the arm flat and make 6 SC across the top to close, fasten off and leave a long tail for sewing. Cut 4 strands of yarn about 6 inches long, slip stitch each one into the ends of the scarf to create a fringe. I left my starting and ending yarn there as fringe as well, no need to weave them end. Cut all strands to make them even as needed. 1. Sew the head onto the body, making sure to have the facial features centered. Add extra stuffing in to the neck as you go to keep it firm and less wobbly. 2. Next, sew the arms onto the body centered with the head at round 45. 3. Sew the tail to the back of the body, adding stuffing as you go. 4. Lastly, I folded the scarf in half around the neck and pulled the ends through the loop. Yay! Your llama is complete! Feel free to share a picture with us in the group, we'd love to see your llama! 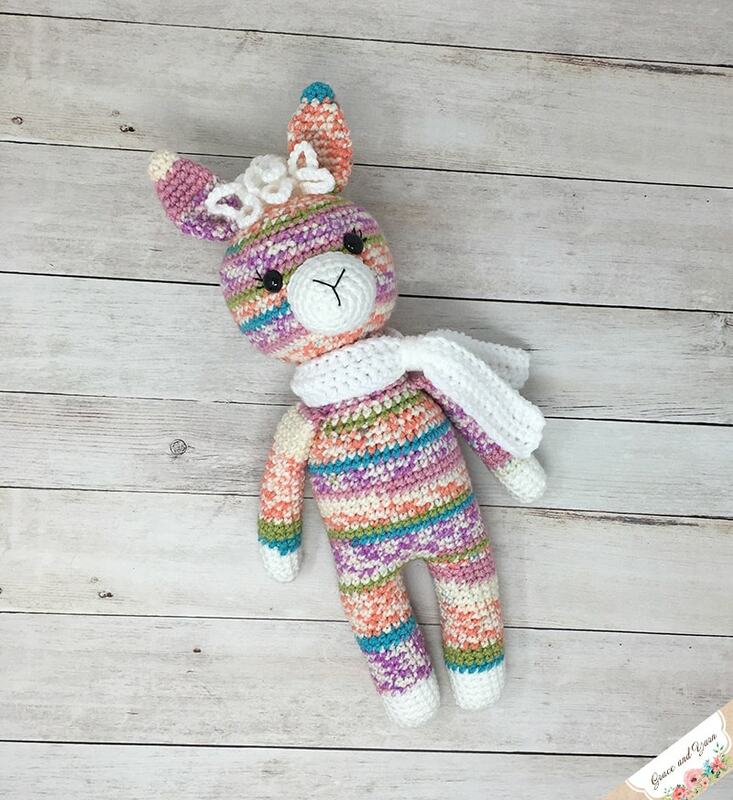 The Llama made with the multi colored yarn would be a perfect gift for a friend of mine. What yarn did you use? I loved using this yarn! It's I Love This Yarn by Hobby Lobby in Sherbet Stripes! Can you make it without the scarf? 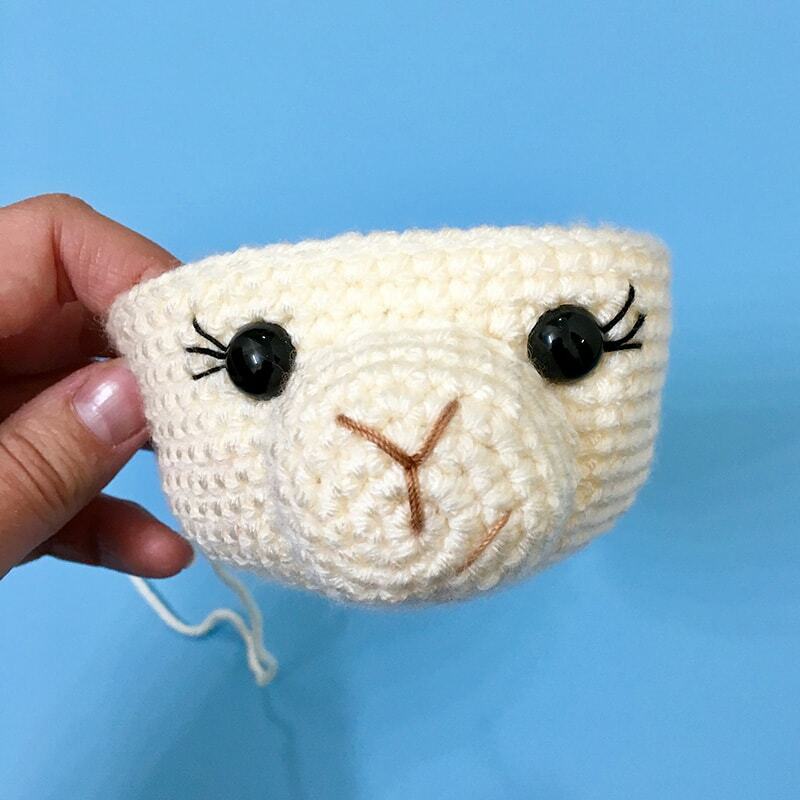 I made this llama over the weekend and I am in love. Thank you for your lovely pattern! I made the girl Llama with a red rose in her hair and put a red dress I crocheted on her instead of a scarf. I love this project it was so fun!!! Keep up the great work!!! Sounds soo cute! I'm so glad you enjoyed the pattern, thank you for your kind words! Muito obrigada. Parabéns pela aula.